JoJo, born Joanna Noelle Levesque on December 20th, 1990, is an American pop/R&B singer-songwriter and actress. JoJo first entered into the pop scene with her smash hit "Leave (Get Out)", from her self-titled debut, the first of three singles released from that album. "Leave (Get Out)" was followed up with: Baby It's You", which was released as a remix titled "Baby It's You (Remix) (feat. Bow Wow)", and "Not That Kinda Girl". She has been in two movies, Aquamarine and RV, both released in 2006. She also sang the song "Secret Love" for the movie Shark Tale. 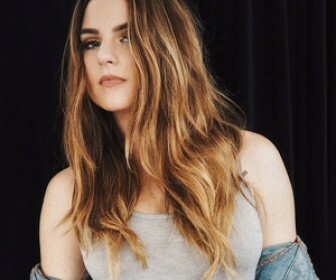 JoJo's sophomore album titled The High Road hit stores October 17th, 2006, and debuted on the Billboard 200 at #3, with 108K in sales (about 13K more than her debut, which debuted at #4 on the charts) Her first single off the album was the smash hit "Too Little Too Late". The confirmed second single was "How To Touch A Girl"; the video for "How To Touch A Girl" premiered (on MTV's TRL) on December 7, 2006. Due to the failure of "How To Touch A Girl" (lack of promotion), JoJo released a third single, "Anything". "Disaster," the lead single from JoJo's third studio album Jumping Trains was released to US radio on August 29, 2011 and made available for purchase as a digital download on September 6, 2011. (Disaster Songfacts). As a child, she appeared on Bill Cosby's show 'Kids Say the Darnest Things' and sang a song by Cher.